Each of Eva Maerz’s rose-filled pillows is an ambassador of love. And they have touched many people. 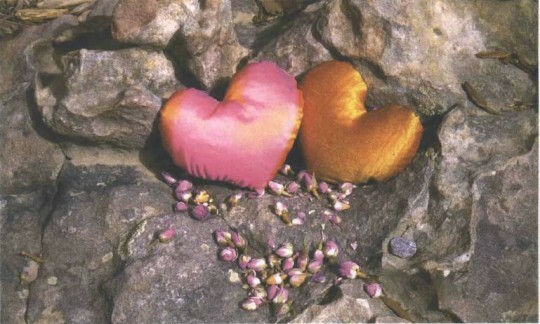 The popular pillows have been given as gifts to lovers, spouses, mothers, daughters, friends, employees, and strangers, for occasions such as weddings, retirements, thank yous, recovery, stressful situations, and comforting the self. One man bought a pillow to carry in his sleeping bag while traveling the world. Another gave one as the final offering in a coffin. Wherever they go, these gifts are reminders to open the heart. For Eva, they are a means of right livelihood; a way to make a living while encouraging people to remember love. Based in Munich, Germany, Eva started making the pillows in 1982, as a way to work from home, while spreading the message of a good heart. She had previously worked as a healer and teacher of herbs, and knew the soothing effects of the rose. She had also recently returned from living in Kopan Monastery, Nepal, and wanted to share her spiritual teacher’s work. And she needed to support two young children, who came to live with her when their mother, Eva’s sister, died.